Counting down the days to my holiday in Crete.. This is the lovely little top I featured on my blog not that long ago, its the first time Ive worn it and I just love the oversized peter pan style collar.. the skirt is also new from Topshop I love the soft fabric, contrasting waistband and of course the colour! I was also tempted to get it in a coral colour with navy waistband..maybe for my hol!? Black stone ring and kiss ring: Asos, Random sheer tights. I love the top, it goes great with the skirt! You always have such great back drops to your images too! 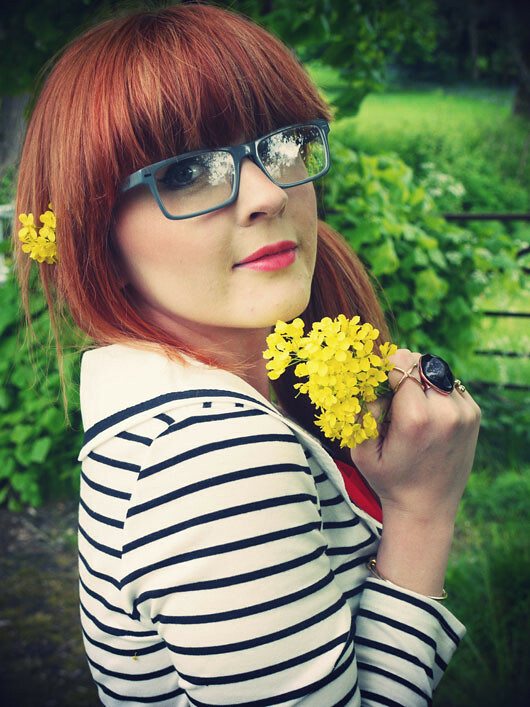 Loving the oversized collar, you look gorgeous in this outfit, such cute photos with the flowers. This outfit just lovely! I absolutely adore the colours - the yellow is so pretty and summery! Your outfit is adorable. I think you should definitely get the skirt in the coral colour as well! The top is gorgeous! The colours of your outfit remind me of snow white! That shirt is adorable. I like the oversize collar. The last picture of you is so lovely! gorgeous! you are so amazingly pretty, very jel. and I would never have thought these two would go well together, but they do completely. you must have a great eye! Absolutely adore this outfit! and Love your bag also.. so cute! these are gorgeous photos! 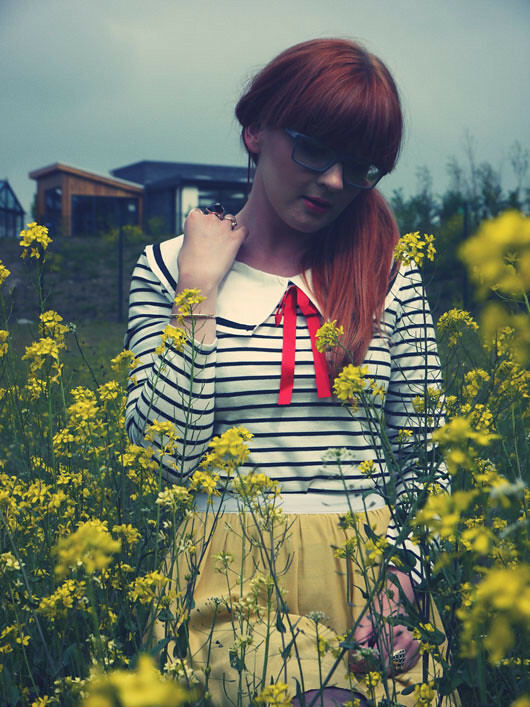 loving that nautical style top, very sweet! i have the skirt in blue and i love it, i want the coral too! ugh! tamn shop. Gorgeous outfit and such pretty photos as per usual. oh my god. The best outfit in the history of time!! That top is amazing. If I could design the worlds most perfect top that would be it. And I love the cool color of that bag! that top is the cutest top everrr! Great look I love the yellow skirt. Oh, i love your outfit! You look amazing! I have this skirt in blue, and I'm totally tempted to get it in every colour- it's so wearable! how can people be so beautiful? This outfit is killing me with its cuteness! I love all the usage of colors in this post!! Yellow shots in it make me swoon and the bowtie is so cute. Just discovered your blog and it's sooo sweet! loving the styling and pics! 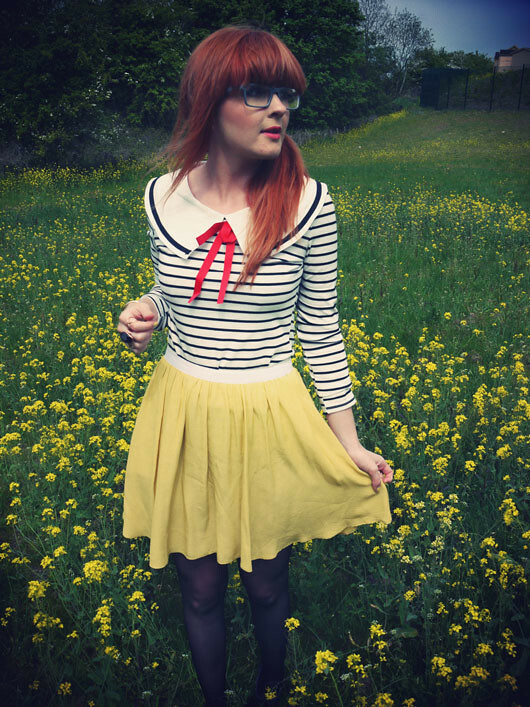 This outfit is adorable, love the bow-tie and the yellow skirt and the scenery! the skirt is really lovely and summery! hope you'll find some time to check out my blog and follow if you like it! This outfit is gorgeous! You've put it together so well. Just found your blog and I love it, following! 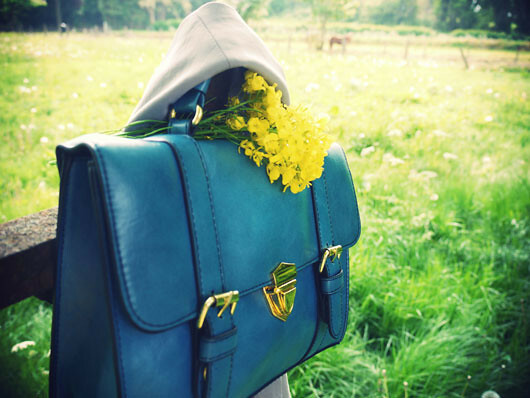 Such a pretty post, lovely outfit and the satchel is adorable! BEAUTIFUL! Your hair! That skirt! These are such beautiful photos!!! What a pretty field of yellow flowers. You look so sweet in that last photo. So much to love about this, especially the skirt! You look absolutely gorgeous! I am in love with your outfit. That collar and bow is so cute!